Scour music blogs and magazines from over the past three to four years and you’ll find numerous assessments that clump Crystal Stilts into groups of low-fi indie acts employing mountains of reverb and choppy guitars. Obviously, it fits. These bands offer listeners an endearing, nostalgic throwback sound paying homage to the heyday of important indie rock flagship labels like K, Sarah and Slumberland, and all have earned their critics, lovers and haters. Nowadays, as the die-hard music fans we are, we create our own small networks, preferences and micro genres of music. It’s extremely difficult to keep track of a lot of these bands, and the sounds that actually delineate our preferences continue to blur. This also makes it impossible to navigate the musical landscape in general, or at least stay emotionally invested in every single act with a Bandcamp account. The Crystal Stilts are one of these groups that could have easily gotten lost, but they’ll always have my attention. 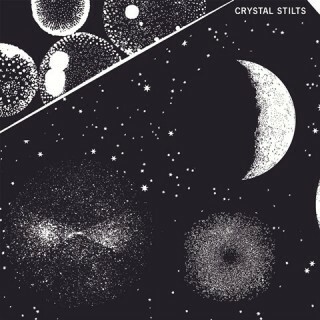 Crystal Stilts come off as a band that’s perfectly comfortable flying under anyone’s radar and seem more invested in making foggy, guitar-driven pop as a means of everyday escape instead of worrying about landing on the pages of thousands of music blogs, or, as a backdrop for getting super high with your buddies — both work pretty well. For me, it all starts and ends with Brad Hargett’s Nyquil-induced baritone (so casual, and delivered with an ounce of care). I’ve read countless reviews that inaccurately compare him to Ian Curtis but Hargett sounds much closer to Calvin Johnson singing over The Velvet Underground (I would kill to hear Crystal Stilts cover “Don’t Touch My Bikini“). Separate his voice from the music altogether and he’s an odd choice as a frontman. Add the cavernous sound of his bandmates and Hargett is absolutely perfect, carefree and lost in his own world. dude, your like blowin’ my mind with this stuff. thanks again for all the work you do. this site is, well pretty amazing. you have single handedly introduced me to a world of textures and sounds i wouldn’t otherwise know about. thanks to you i never have to listen to the local crapfest radio stations, esp. the public radio station here in louisville that thinks its too cool for school. your endless and brilliant taste in music offers me a glimpse into a universe of awesomeness. What he said…the guy above me…ditto. I was a little surprised at myself, but I absolutely loved this album. Not surprised because I don’t like the genre so much, because I do, but just because it wasn’t really high on my radar screen, but I picked it up because it looked “interesting”. Sometimes you just don’t know until you’ve listened through an album a couple of times. A definite winner. God, you nailed it. Calvin over VU. Rad review as always, man.